SUMMARY: Fourteen-year old Audrey hasn't returned to school since incessant bullying led to a mental breakdown. In the months since, she avoids people, stays inside her house, and hides behind dark sunglasses. But when her brother's friend Linus shows interest in Audrey, she starts to make slow progress. Can she trust this new outsider with her heart? 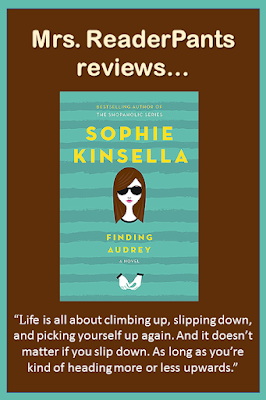 REVIEW: I read Finding Audrey because it was nominated for the Panda Booklist (it didn't make it, sadly) and because it was written by Sophie Kinsella. I have read several Kinsella books, and they are always fun and fresh. I love the way Kinsella writes, especially the way she mixes humor with more serious topics. I absolutely loved that Audrey's family is so normal. You have a mom who is neurotic and freaks out about everything from poor nutrition to too much screen time. The dad works a lot and just wants everyone to get along. Older brother Frank (my favorite character) is so sarcastic and dramatic and I just loved him. Younger brother Felix is just cute and gross and a mess, as most four-year olds are. In between, you have Audrey, who was excessively bullied at school and is now coping with the resulting severe social anxiety and depression. There is romance in this story, but the book more about Audrey's mental illness than her romance with Linus. It's a sweet romance though, and Linus is a gem. He is probably a bit too perfect, to be honest, but the story is from Audrey's POV, and that is how she sees him. In my library, I had filed this under the Romance/Chick Lit genre, mainly because of the description and because Sophie Kinsella's books are generally Chick Lit. But I am moving it to Realistic Fiction instead. The mental illness and Audrey's family are the story here; the romance, while important, isn't the main story. THE BOTTOM LINE: Mental illness is a hot topic in YA literature in the past couple of years, and social anxiety in YA fiction is a trend I've seen more of in the past few months. Finding Audrey handles mental illness with honesty and sensitivity, and as such, deserves a place in MS and HS libraries. STATUS IN MY LIBRARY: We have it. I booktalked it while I had it checked out, and several students put it on-hold. They were very interested in the anxiety aspect, and in one class, we had a lively discussion about teens and anxiety. I didn't love this book, but very much appreciated it and hope for more like it. I put it in a category with The Unlikely Hero of 13B. I'm still debating putting it in my sixth grade library, though. I don't have many books that kids can relate to the anxiety, though, so I may just do it. Thanks for your take on it.